•Each Concert Program Features a Different Lineup! Want to hear some of Ancient Future's early music performed live, but don't live in the San Francisco Bay Area? You are in luck, because Ancient Future will perform live on The Hear and Now with Derk Richardson on KPFA, 94.1 FM, Berkeley, California. The broadcast will take place on Thursday, February 7, at 10 PM PST, which is Mindia Devi Klein's birthday. Special thanks go out to Jason Ranjit Parmar (tabla, udu) and Mariah Parker (piano, santur). They will be filling in for original Ancient Future members Benjy Wertheimer, who will be flying in for the 40th anniversary concert, and the late Phil Fong. The broadcast also streams live. Visit kpfa.org at 10 PM PST and click the Listen Live link. The archived broadcast will be available for two weeks. Purchase Tix: $20 in advance at the F&S, $24 at the door. All tickets are subject to an additional $4 per ticket facility fee. Box Office Phone: 510-644-2020, open 12:30 PM – 7 PM (excluding holidays) and during all performances. 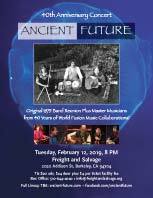 Ancient Future's first concert took place on February 11, 1979, at the Sleeping Lady Cafe in Fairfax, California, a vegetarian cafe and music club co-op that was the center of a vibrant local music scene. It was the day before Ancient Future leader Matthew Montfort's birthday, who was not yet of nightclub age. This concert on Montfort's birthday celebrates Ancient Future's 40 years at the forefront of the world fusion music movement. Purchase your tickets now to insure the success of this one time event! Support the 40th Anniversary Season with a Tax Deductible Contribution! By making a tax deductible donation to Ancient Future through InterMusic SF, you can help support Ancient Future's local Northern California concert season, provide seed money to bring Ancient Future to perform in your area, or support new compositions and recordings. 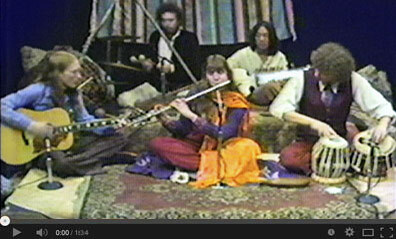 Make a Tax Deductible Donation to Ancient Future Through InterMusic SF! You can also help by signing up to support Ancient Future's fan funded recording project, the Archive of Future Ancient Recordings. 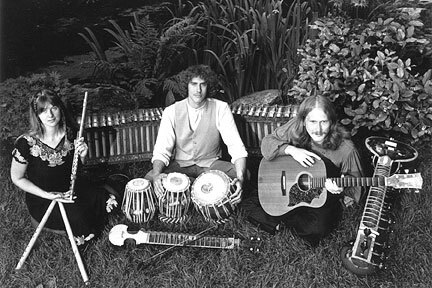 The first set of the 40th anniversary concert will feature original band members Matthew Montfort on scalloped fretboard guitar, Benjy Wertheimer on tabla, and Mindia Devi Klein on bansuri and silver flutes. Mariah Parker will play piano and fill in for the late Phil Fong on santur. Visions of a Peaceful Planet by Ancient Future (Ancient-Future.Com AF 2004) $19.98 list. Buy Audio/Video E-CD Now. The second set will feature band members from Ancient Future's major label releases along with top master musicians from around the world who have a long history of cross cultural music collaborations with the band. Confirmed performers include Georges Lammam on Arabic violin, Vishal Nagar on tabla, and Doug McKeehan on keyboards. World Music Studies for Listeners! Want to get more out of listening to music? Study of music traditions isn't just for musicians. The more you know about music, the more you will get out of listening to it. 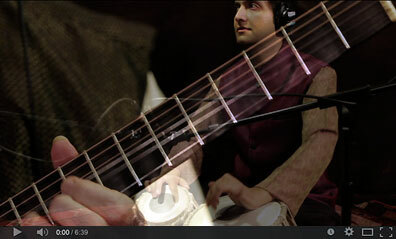 For example, many listeners are attracted to the spiritual feeling of Indian classical music. But knowing the basics of tala (Indian rhythm cycles) will greatly enhance what one experiences while listening. A great way to get started on a journey to become a better listener is to visit the education section of Ancient-Future.Com. Included are explanations of African, Arabic, Balinese, and Indian traditions along with some basic exercises to practice that require no instruments to perform. As you learn more, you may wish to take a private Skype lesson to continue your studies. 30 Minute Skype Lesson. Normally $50. Sale $36. Buy 1 Now. Each Concert Program Features a Different Lineup! Matthew Montfort leads this series of free hour long educational library concerts. Every show in the series features a different program with different musicians! 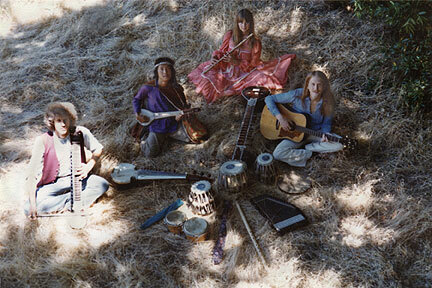 Wednesday, February 20, 7 PM, Ancient Future History with Matthew Montfort (scalloped fretboard guitar), Mindia Devi Klein (bansuri, silver flute), and Mariah Parker (santur), Petaluma Regional Library, 100 Fairgrounds Dr., Petaluma, CA 94952. Saturday March 30, 2 PM, World Without Walls Trio with Matthew Montfort (scalloped fretboard guitar), Doug McKeehan (keys), and Ian Dogole (percussion), Northwest Santa Rosa Library, 150 Coddingtown Center, Santa Rosa, CA 95401. Saturday, April 20, 2 PM, Guitar and Arabic Percussion Duet with Matthew Montfort (scalloped fretboard guitar) and Antoine Lammam (Arabic percussion), Central Santa Rosa Library, 211 E Street, Santa Rosa, CA 95404. 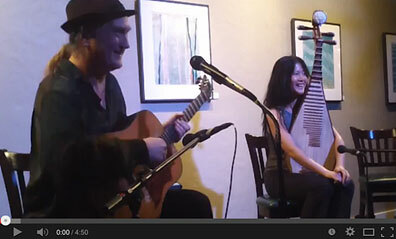 Saturday April 27, 2 PM, Guitar and Pipa Duet with Matthew Montfort (scalloped fretboard guitar) and Shenshen Zhang (pipa), Sonoma Valley Regional Library, 755 West Napa Street, Sonoma, CA 95476. Saturday, May 4, 2 PM, Guitar and Tabla Duet with Matthew Montfort (scalloped fretboard guitar) and Vishal Nagar (tabla), Rohnert Park-Cotati Library, 6250 Lynne Conde Way, Rohnert Park, CA 94928. 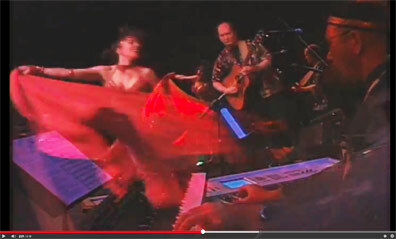 The exact lineup of Ancient Future that performed on the band's influential World Without Walls and Asian Fusion recordings will reunite to perform at the San Francisco International Arts Festival. 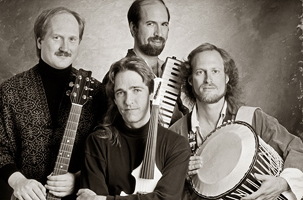 The reunion show features the original lineup of Matthew Montfort on scalloped fretboard guitar, Jim Hurley on violin, Doug McKeehan on keyboards, and Ian Dogole on percussion.